MEMOFIN - 2013 CRA Supervision and Policy Work Plan - L'information financière que vous ne trouvez nulle part ailleurs ! 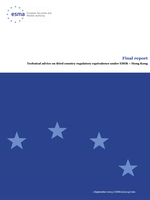 The European Securities and Markets Authority (ESMA) has published its 2013 CRA Supervision and Policy Work Plan. In the work plan, ESMA sets out the key elements of its supervisory programme for the 19-registered and 1 certified credit rating agencies (CRAs) in the European Union (EU). The annual work plan is approved by ESMA’s Board of Supervisors, which is composed of the relevant authorities from the EU’s 27 Member States. “We are all aware of the influence that credit ratings have had, and continue to have, on the EU’s financial markets. Today’s work plan sets out our areas of focus for the next 12 months which aim to ensure that CRAs continue to meet the high standards expected of them when producing credit ratings. This is a further concrete step in the development of a credible supervisory regime which expects CRAs to embed good practices internally and to ensure that they meet the requirements of the CRA Regulation.